We believe that local restaurants, taverns, caterers, and food trucks in each stopping town are the best places for our participants to get the best possible dinner at the best value at because it is their profession to do so. They are inherently motivated to do a great job in order to earn and keep your business and their atmosphere gives the best possible local flavor of each town we stop in. One of the best things about having dinner at restaurants is that you will be able to go and eat dinner when you want to. You won't arrive at the end of the ride at the same time as every other participant, so why should you wait to have dinner all at the same time? You won't have to wait to eat all hungry and tired from the road until a specific serving time, only to wait in an incredibly long serving line with everyone else who had to wait for dinner. We will work closely with the local restaurants in the stopping towns so that they are expecting and fully prepared for us! In larger stopping towns where there are numerous restaurant options available within a reasonable walking or biking distance from the ending location of the ride, you will go and get dinner on your own. If not enough restaurants are nearby we will provide shuttle transportation for you that will run late into the night. 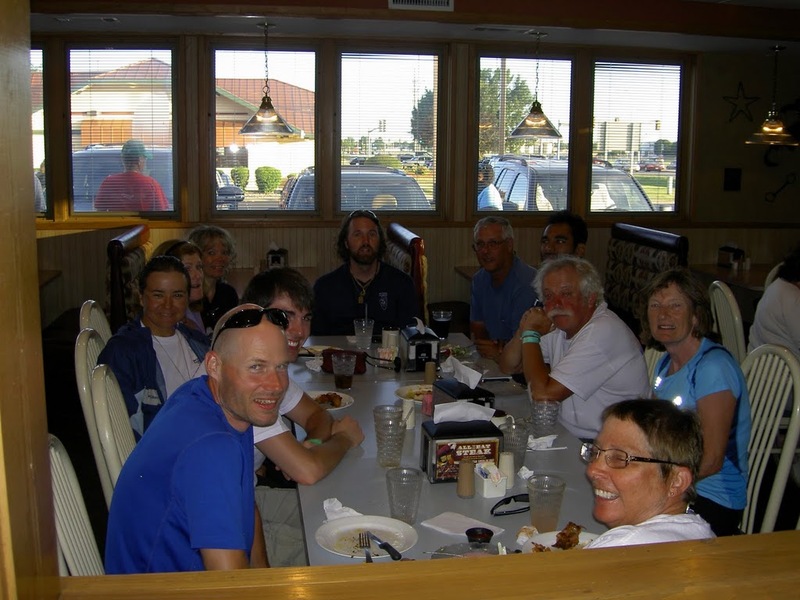 In very small towns with a limited number of restaurant options we will coordinate a group dinner with a local food service provider either directly at the ride ending location or very close to it. Dinners will have a local flavor and vegetarian options will always be available. Most participants are usually interested in going to dinner together to get to know each other a little better and we will help coordinate this on an informal basis. In some stopping towns we have restaurants that we strongly recommend for dinner. Typically these are restaurants that we know have nutritious dinners appropriate for cycling and are friendly and accomodating to our participants based on years of previous experience. If dinner if included with an event, it will be prearranged by us, served at a designated supporting restaurant in each stopping town, and will always be all-you-can-eat. Where possible the restaurants are more local, mom and pop style (i.e. non-national chains). Some of the restaurants will have a buffet set up and others will serve you individually plated meals. At the non-buffet restaurants you are free to order all you want if you are still hungry after your first plate, but please help us keep the price of our events low by eating all you take. Dinners prearranged by us will only be provided at the supporting restaurant in each stopping town. If you decide to eat dinner at a restaurant other than our supporting one, you will not receive a refund for dinner. The hours of operation for the supporting restaurant in each stopping town will be listed on the in town maps. Most of the restaurants will be open when you arrive in town and if they are not, they will open very soon. The dinner menu selection will be simple but very high quality and quantity. Most dinners will consist of pasta type dishes accompanied by salad and bread. These types of meals are perfect for the nutritional needs of cyclists since they are high in carbohydrates, extremely nutritious, and very appetite satisfying. All dinners will also include non-alcoholic beverages such as iced tea, pop, or milk. We will cover the gratuity for all prearranged dinners, but if you feel that you've received outstanding service you may certainly leave an additional tip for the wait staff if feel they provided you outstanding service. If you wish to drink alcoholic beverages you will need to pay for them on your own. We will need to be very strict about making sure only the right people receive dinners prearranged by us at our supporting restaurants. All restaurants will always check your wristband to identify you as a participant and will be strictly instructed not to serve anyone without a wristband. Specific procedures at each restaurant will vary, but may include such actions as checking your ID against an approved guest list supplied by us to them and using meal tickets or punch cards which you will receive in your registration materials. If meal tickets and/or punch cards are used, they will be good as cash and cannot be replaced so you will need to put them in a safe place and do not lose them. Only a limited number of meal tickets will be issued and if you lose them you will have to pay for dinner on your own.